Well, in the last 6 weeks I’ve been in Africa, and I’ve been in Greece, and Greece is hotter. Much hotter. The thermometer on our “air conditioned motor coach” (as the brochure describes the bus at every stop) read 40° C this afternoon—104º Farenheit. Damn hot. 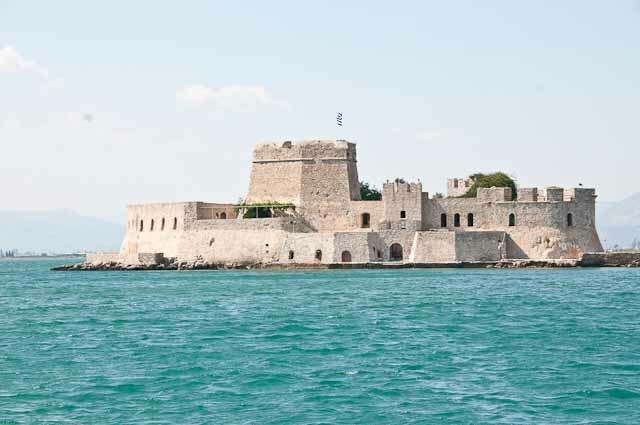 Navplion is a beautiful port city, which was in fact the first capital of Greece. Many of the older homes are gorgeous neo-classical palaces built during the time Venice ruled the area. Our tour today was a bus ride to Corinth, to see the canal. This body of Greece is a land mass connected to the European continent by a small isthmus. 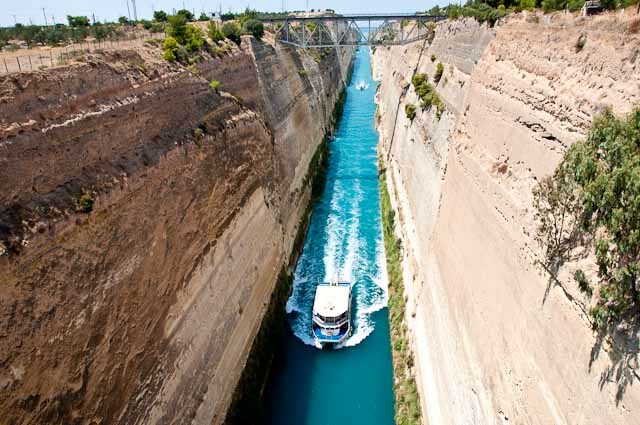 Starting 2500 years ago, people wanted to cut a channel across that isthmus, to connect the Ionian sea with the Aegean sea, thereby avoiding the need to sail entirely around the body of the nation. Finally, in 1893, the same company that constructed the Suez Canal, run by Ferdinand de Lesseps, completed a 6KM canal, and the two seas were joined. It is not large enough for cruise ships or tankers, but many smaller ships make use of the canal, at tolls ranging up to €3000. So we looked at the canal, chugged an ice cold coke at the local cafeteria, and got back on the bus. They took us to some tiny winery to sample the local product, which wasn’t very impressive, and back to the bus. The ride through the countryside was pretty; they seem to be much more active and professional at agriculture here than they were in the last stop. This is citrus and grape country—hot and dry. It looks like the hills in southern California, but a bit rockier. It isn’t really fair to make fun of their English, but I just can’t resist. Given the taste of the wine, this may not be an error…. While this area of the country is nicer and better developed than the last one, there is still too much trash by the road and too much graffiti on the buildings. The cell phone service continues to be impressive, with solid coverage almost everywhere. Part of our drive was on a new toll road, which was just beautiful—and much safer than the small side roads. I assume that it is standard for Greek drivers, but I noticed that our bus driver simply blew through the stop signs—not slowing down and rolling through as you or I might, but full speed ignoring the signs completely. Just a little added adventure for our day. More caviar at dinner. I’m homing in on just the right mix of egg yolk and onion and have learned to keep a roll handy because I don’t much care for melba toast—who the heck was Melba anyway, and what has she done to my toast? The braised lamb shanks were succulent, and the evening cheese plate was magnificent, paired with an Austrian trockenbeerenauslese, one of my favorite dessert wines. The show tonight was a rehash of Hollywood musicals, and not at all bad. It takes a certain hubris to think that the male singer can handle the role of Tevye, from Fiddler on the Roof, the Julie Andrews role from Victor Victoria and the emcee from Cabaret, with completely different ranges and styles, but I guess you do the best you can with what you have. We’re hitting the sack early tonight to be up in time to watch as we transit the Dardanelles in the morning. I get to play bridge with Micky at 2:30, and we’re going to the Italian specialty restaurant for dinner. Should be another great day.